This article is about the village in Devon, England. For the place in Tierra del Fuego, Argentina, see Estancia Harberton. 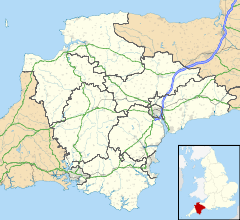 Harberton is a village, civil parish and former manor 3 miles south west of Totnes, in the South Hams District of Devon, England. The parish includes the village of Harbertonford situated on the main A381 road. In the 2001 census the parish had a population of 1,285. The village is a major part of the electoral ward of Avon and Harbourne. At the 2011 census the ward population was 2,217. The village takes its name from the River Harbourne, which flows through the parish. The Parish Church of St Andrew is a fine building of the 14th to 15th centuries with a handsome tower. The late medieval rood screen is a notable example with richly carved cornice and vaulting. The font is a very fine piece of Norman work and the pulpit is 15th century. Harberton is home to the Harberton Croquet and Social Club, which was founded in 2002 and hosts the popular Summer Cup. This is the only club in the country that plays by Harberton Croquet Rules, rather than the more commonly played variations of croquet rules. Harberton was the home of Mary Ann Varder (1842–1922), who married Thomas Bridges on August 7, 1869 and moved with him in 1871 to Tierra del Fuego. There they established an estancia in 1886, which they named Harberton after Mary's birthplace. According to Risdon (d.1640), Harberton was the residence of Alric the Saxon. Harberton was one of twelve feudal baronies in Devonshire said to have existed according to Pole (d.1635). It was not however recognised as such in the 1960 work by Sanders, English Baronies. Harberton is not mentioned in the Domesday Book of 1086, as it was then a constituent estate of the manor of Chillington, which is listed. According to Risdon (d.1640), Roger le Bigod (d. 1107), was seized of lands in Harberton. Roger II de Nonant (d.circa 1177), a supporter of Empress Maud. Roger III de Nonant, who married a certain Alice, but without consent of King John (1199-1216), who seized his barony of Totnes back into crown lands. The feudal barony of Harberton was granted to the de Vautort family, feudal barons of Trematon, Cornwall. Surviving sources (i.e. Pole, Risdon and Sanders) confuse between themselves the names Roger, Reginald and Ralph de Vautort, leading to disparate and irreconcilable accounts of the true descent of the family. All accounts however agree that it was held for several generations by this family, which died out in the male line in the 13th century. Dr John Huxham, the surgeon and doctor, was born here in 1672. ^ "Avon and Harbourne ward 2011". Retrieved 19 February 2015. This page was last edited on 16 February 2019, at 11:37 (UTC).